I’d always loved Norah’s voice. It’s very distinct, very well rounded, the perfect combination of husky and soft. That’s only the background. 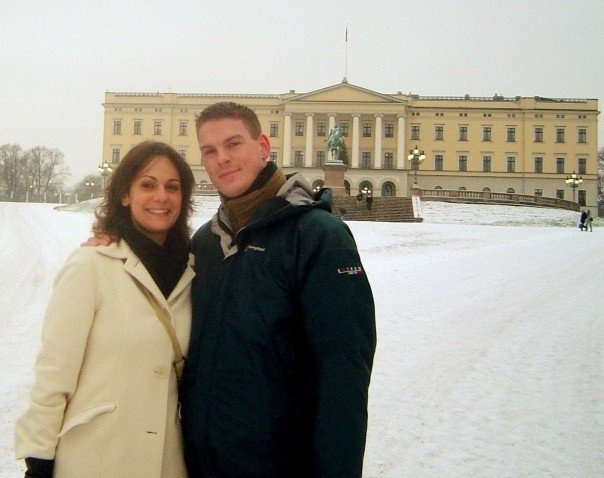 The story is actually set in FREEZING Uppsala in the winter of 2005. I was in my boyfriend’s car and he was taking me to a friend’s house. My friend and I were going to bake some delicious cakes all evening, in order to sell them in the market the next day, to raise funds for a mission trip to central Asia. I was quite excited, really. But then I noticed Iain (the boyfriend) turning into my own drive way. “This is not the way to Rehanna’s” I said, puzzled. With a huge smile on his face, Iain instructed me to go upstairs, close my eyes and wait for him. As you can imagine my excitement levels rose! And rose even more when he came upstairs and presented me with a gorgeous luggage set, and a voucher that entitled me to spending the weekend away with Iain Faulds, at a destination of his choice! Weeeee! Now THIS was exciting! Iain asked me to pack and told me I was getting picked up the next morning at six am. Oh wait you want to hear the end of the story? Well, Iain whisked me away to snowy Oslo and took me for an amazing lunch at this awesome bistro with live big band music. He then hurried me away to Akerhus Fortress before the sun went down, and proposed 🙂 I said yes (although he argues it was just a brief sigh with some kind of sound in it), and we lived happily ever after! A pretty great story, I reckon! My only concern is that I let down my friend Rehanna. But when I look at her new business: “Fab cakes of London”, I figure, I only would have held her back. Her baking skills are far superior to mine!